Popular Illumination and light-up sceneries. Tokyo German Village（東京ドイツ村ウィンターイルミネーション) has a beautiful Winter Illuminations. 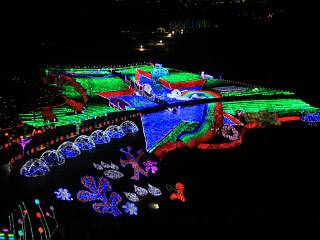 It is considered as one of three major Winter Illuminations in Kanto. About 2 million LED will decorate the winter sky so beautiful. Every year, they have the different concept of lights. From the middle of November to the end of March, the lights play with the music for you. Admission: 1500 yen for parking. No car entry: 500 yen per person. 1. use Express bus to Tokyo German Village.